Do you protect your brushes? For some of us, makeup brushes can amount to a big investment and it pays to look after them. It’s only fairly recently that I’ve bothered – to be honest, I’m a little bit easy-come-easy-go as my Mum used to tut at me whenever I was being less than careful with my possessions. I use Brush Guards to protect my favourite brushes. 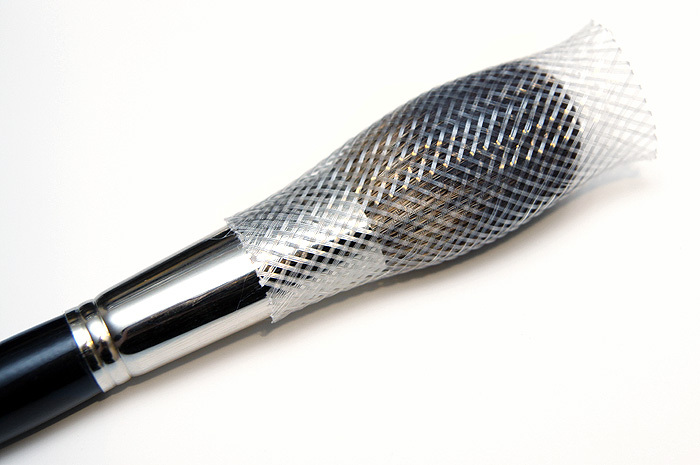 The mesh slips over the handle and cradles the bristles tightly, it’s not the perfect solution for travelling but I love them after washing my brushes as I can simply stand them on end (brush guard down) and this protects the ferrule whilst ensuring that the bristles dry to a perfect shape. Infact, they’ve even recovered some of my domed brushes that I thought had lost their shape for good. A worthwhile investment! 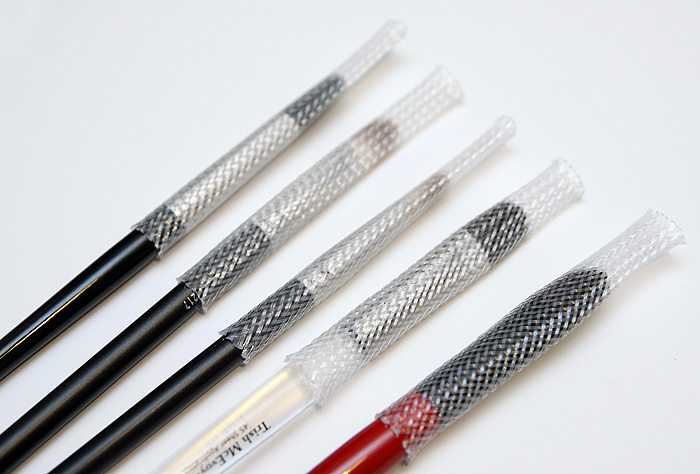 Brush Guards are priced at around £5.95 a packet and come in various sizes from eyeliner-brush sized right up to kabuki. I bought mine a long time ago from Cocktail Cosmetics. Shockingly I’ve never bothered but with you saying you’ve improved the shape of some of your brushes, I wonder if I ought to invest. Off for a lookie-loo now! I barely even clean my brushes, it’s so bad I know but I just wonder what else I could be doing rather than baby shampooing my brushes. I do like the look of the guards though, and as someone who travels A LOT it might be a good investment. I love my brush guards! They’ve really brought back shape to some of my domed/tapered brushes, namely the MAC 165 and 217. I’ve actually found them to be terrible for travel because if the brush guard gets jostled back toward the handle it ruffles up the bristles and damages them. These are so neat! I don’t use brush guards, but then again I rarely wash my brushes. . . maybe I’ll wash them today! I love Brush Guards for after I’ve washed my brushes, I wouldn’t be without them. I agree they’re not great for travelling though, brush rolls are better for that I think. They’re also not good for double-ended brushes – that’s just awkward. I have a set of Brush Guards and I use them after I wash my brushes. I think they’re fab! I use brush guards when I have to travel with them, or after I’ve washed them. Other than that, they just live their life in their brush holder, and I don’t get too paranoid about dust falling on them or that kind of thing. I love using the Brush Guard to protect my brushes when I am not using them and drying them after washing. Definitely a worthwhile buy to protect the brushes. You guessed it! Cover Your Gray for Women root touch-up!